Cold War is very similar to “Dalek”. It’s got an old enemy in a new design voiced by Nick Briggs. It’s set in a claustrophobic area. 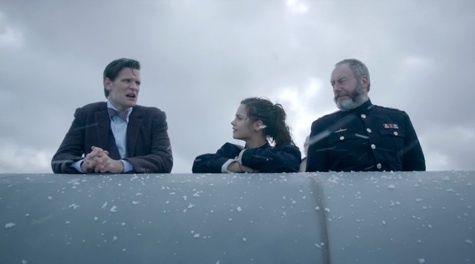 It’s got a scene where the new companion faces the big evil new/old monster and something unexpected happens. But unlike “Dalek”, Cold War just isn’t that great. It’s not as bad as The Rings of Ahkaten, but it still feels incredibly “meh”. Let’s start off with the thing that makes this episode memorable: The Ice Warrior. I’m going to be honest, I love the design. But let’s be real here. Nobody likes that head. How does it fit in the armor? How do those skinny arms and large hands fit in the armor? The armor that has lego hands! How does this make sense?! I really love the armor design, and I like how they showed us the being inside the armor, but the end result is an awful waste of CGI. It’s just cringe material. Another con is the cast. Wait, don’t shoot! The actors are excellent in their roles, but the fact that they’re not speaking in a Russian accent makes the whole “you speak excellent Russian.” a little less believable. It feels as if Moffat and co aren’t even trying to make the whole thing believable. Clara still feels like a piece of cardboard. While it feels like we’re moving forward with her character (her not running off when the Doctor tells her not too is a nice touch, but why is she so resistant to singing?) It’s as if the car which is made of Clara’s characterization is on a road and has hit a road block, and instead of waiting for the road block to move, it’s just pushing the road block forward. You don’t push the road block forward people. You can tell Moffat is trying to form a character, but it’s as if he can’t help but put in traits of past companions. Feisty, intelligent, flirty are the first three traits that come to mind when I think of Clara. Oh wait, that’s not right. They’re the first three traits that come to mind when I think of every NuWho companion (bar Donna.) Surely Moffat can write something other than flirty and feisty characters? If you thought that was the last rant, you’ve got another thing coming! The ending is way too rushed and the denouement of the story is done and dusted far too quickly. Some say it should have been a two-parter, but that isn’t the case. Material around act 2 where the crew’s looking for Skaldak should have been cut down and instead there should have been a better resolution to the story. But hey, this episode has some good things about it. The direction is excellent and moody. The dialogue is crisp and refreshing. The tone and camera angles are excellently done and praise must be given to the director, Douglas Mackinnion. Oh yeah, BLOOD! Two drops of it, but BLOOD! Gasps and shock everywhere. There are some nice moments here and there, and the claustrophobic feel of the submarine is excellent, but all in all it’s not an incredibly good episode. It’s simply average to be honest.